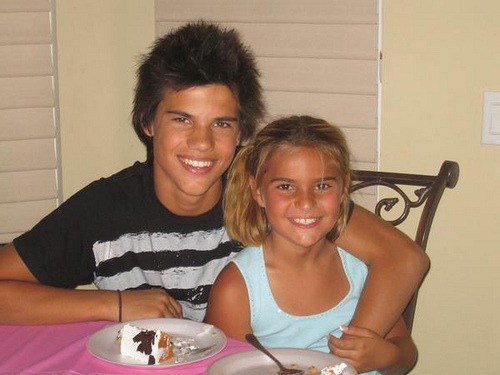 Taylor and his little sister!. . Wallpaper and background images in the Taylor Lautner club tagged: taylor lautner baby sister. This Taylor Lautner photo might contain pause café, pause thé, dîner, table à dinner, and table à dîner. i luv him and his lil sis she is soooo CUTE and he is sooo HOTTT! TAYLOR AND HIS LIL SIS I LOVE THEM BOTH IN DIFFERENT WAYS BUT SINCE TAYLORIS MY BOYFRIEND IT'S TRUE!!!!!!!!!!!!! Taylor is mine!!! xD and his sister is so cute! but he is HAWT!!! soo cute .. they are both so Tan !! cute lil sis !! aww they look really close.i love him. yeah taylor and makena are both cute!!!! taylor is so cute with his little sister!!!!!! Awwwwww!!!!! THEY LOOK ALMOST THE SAME!!! They are so cute together. (in different ways) I see the resemblance. omg i love it! his lil sis is soooo cute!!!! OMG he is soooooooooooooo. is he eating cake? taylor is so sexxxxxxy!!! i love him!!!!!!!!! Aww, they are both cute! Aww Taylor looks so cute with his sister Makena! Aaaw they're both so beautiful and sweet** love this pic!! look so so alike. yoyoyo. i am surprised. How can someone blonde can be soo tanned !? WOW!! they have the same SMILE!!! she is soo cute but OHH HE IS SOO HOT!! But this is different because I am in love with him. Taylor I mean. she is soooo frippin lucky!!!!! MACKENNA YOU HAVE THE BEST BIG BROTHER EVER!!!!! I HOPE YOU READ THIS.....hehehehehehehehehe its true!!!!!! I think they that Taylor and his sister both look cute in there pictures.Taylor also played in SHARK BOY and LAVA GIRL the ADVENTURE. Taylor played as Shark boy.